Interested in MailStore but too busy to install the trial? Struggling to fit in a live webinar? 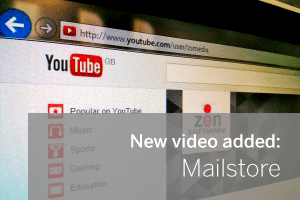 A close second are the recorded versions I post from time to time on the Zen Software Youtube Channel like this one, entitled an Introduction to MailStore. No, you won’t get to ask me lots of awkward questions via the live chat which is obviously a shame (! ), but it is better suited to skimming through over a coffee if you’re flat-out taking care of the day job. In this recently updated recording of the Introduction to MailStore webinar, I guide you through setting up the latest version of MailStore (8.1) to archive an Exchange 2007 server. This session’s ideal if you’re completely new to the product or if you’re planning on installing MailStore imminently and could do with a refresher. I hope you find the video useful and don’t forget, if you prefer the more interactive experience you’re still welcome to attend a live MailStore webinar completely free – just check the link for the forthcoming dates.